As we celebrate the descent of the Holy Spirit upon our brothers and sisters so long ago, let us sing. I will sing to the Lord as long as I live; I will sing praise to my God while I have being. May my meditation be pleasing to him, for I rejoice in the Lord. As you go from this place, hear the words of our brother Rev. Mychal Judge, a martyr of charity in 2001, who often prayed: “Lord, take me where you want me to go, let me meet who you want me to meet, tell me what you want me to say, and keep me out of your way.” May you go where the Spirit guides, meet who the Spirit ordains, speak what the Spirit teaches, and not get in the way of God’s grace and mercy. The following was written by Joshua for Grace and Main Fellowship‘s weekly devotional project: G+M Devotionals. It was also posted on the site of Third Chance Ministries. 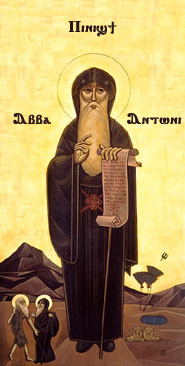 St. Anthony the Great, who some call the “Father of All Monks” and the “Father of Monasticism,” was a third and fourth century Christian leader and teacher who confined himself to the wilderness of the Egyptian deserts so that he might undertake a life of devotion to, and pursuit of, his Lord Jesus. It was in the wilderness that Anthony was pushed away from comfort and predictability and into the forming hands of God. He once wrote, “I saw the snares that the enemy spreads out over the world and I said groaning, ‘What can get through from such snares?’ Then I heard a voice saying to me, ‘Humility.’ ” It was these snares that Anthony fled to the desert to escape, but his writings and prayers make it clear that he found temptation even in a land of lack. As he would often indicate in his later writings, it seems that we cannot ever escape sin or temptation as we carry them with us wherever we flee. But, how do we take up such a path? If we want to be saved and to seek out a Lord who asks us to make ourselves less, then what are the first steps along that path? Almost 1,000 years later, one of Anthony’s spiritual descendants, Gregory of Sinai, encouraged Christians who sought the path of humility not to wonder whether they were or were not a “greater sinner” than their neighbor. Instead, each of us should assume, like Paul in his letter to Timothy (1 Tim 1:15), that we are the foremost of all sinners. 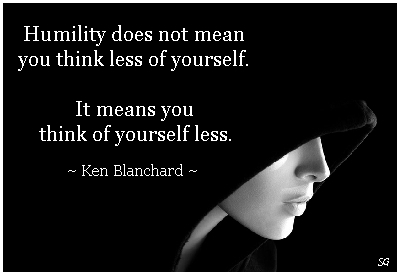 Of course, to do this in word only is to gratify the ego and to drink deeply from the subtle sin of spiritual pride–it is to speak truth while harboring arrogance in the heart. But, if we’ll make ourselves less and make our Lord more, while knowing that our sin is more than sufficient to make us the slaves of evil and death, then we will find that the path of humility leads us out of death and into life–we will find that no snare can restrain us from fleeing to our Father who waits by the road and eagerly searches for his prodigal sons and daughters to come over the hill with repentance on their lips and hearts now empty enough to welcome in a Lord who loves them more than life itself. After all, this is the path–the path of humility–that leads to life both before Anthony said it and continuing now and into the as yet unconsidered future.